Ex-bodyguard D Hunter travels from Brooklyn to Los Angeles to investigate the circumstances surrounding his grandfather's murder in the fourth entry in this series (The Lost Treasures of R&B, 2015, etc.) by critic and journalist George. When D's granddad Big Danny is murdered in what seems a classic gangland hit, D heads for the City of Angels. There, he finds out that Danny's business extended well beyond his small grocery store and the nightclub he had a stake in. When a cop tells D that Danny was a loan shark, D suspects the policeman has mischaracterized a man who makes small loans to his neighbors. But the real story seems to be connected to Danny's relationship with Dr. Funk, a once-great musical innovator who has chosen the life of a semihomeless man, and the clamor over his rumored new tracks. 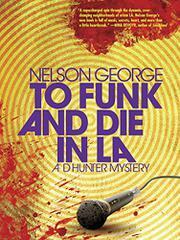 The mystery is the least vital part of a book which has a lot on its mind, notably a consideration of the declining black population of LA; while the reasons offered are police violence, gentrification, and the emergence of Korean residents into formerly black neighborhoods, George's attitude toward the matter isn't always clear. What's most engaging here is what feels like a fan's ongoing argument about the evolution and present form of R&B. The pages are filled with discussions including whether Jackie Wilson was more vital than James Brown, why Jackie Wilson made sure to sing to the ugly girls in the audience, whether The Game is the real Kendrick Lamar, and with name checks to the likes of Madlib, the late J. Dilla, D'Angelo, and Sade. All of this is an attempt to figure out where the music has wandered and where, for the moment, it has arrived. Skip the mystery and read this for its passionate and unresolved argument about the still-beating heart of R&B.